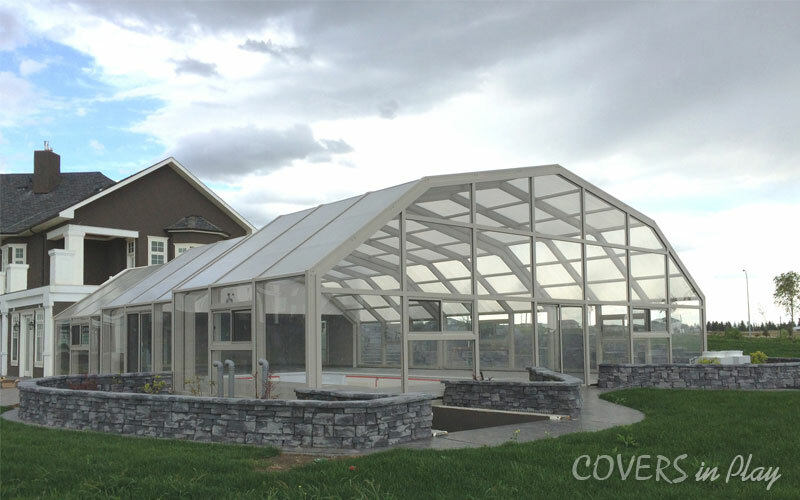 COVERS in Play builds the world’s most modern, state of the art, automatic retractable enclosure systems, specifically for the extremes of our climate. 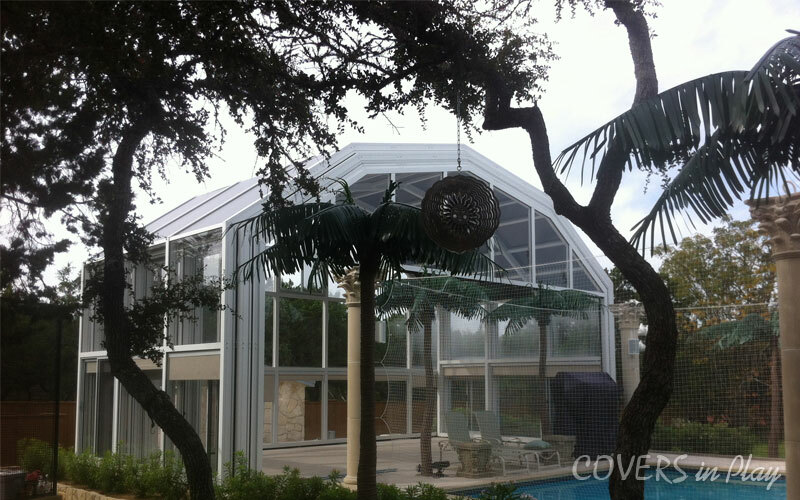 The system is designed with the strength and durability required to withstand hurricane winds and the heaviest snowloads, while maintaining a graceful aesthetic architecture. 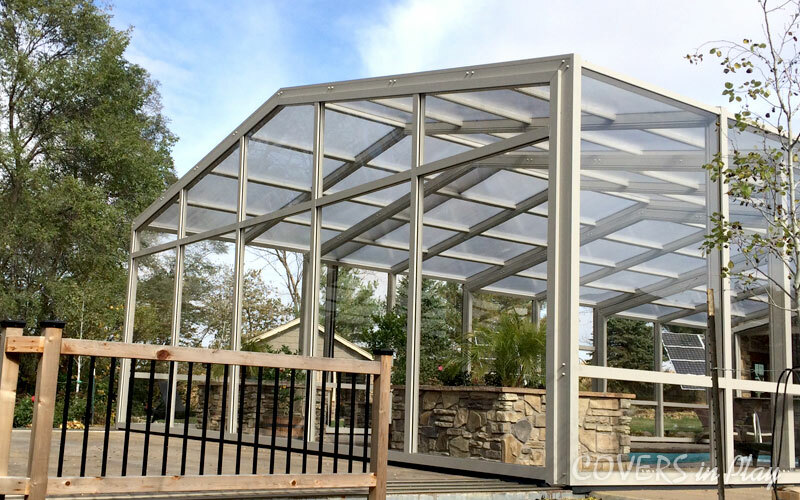 Our enclosure systems have been specifically designed to allow for year round use of the area enclosed. 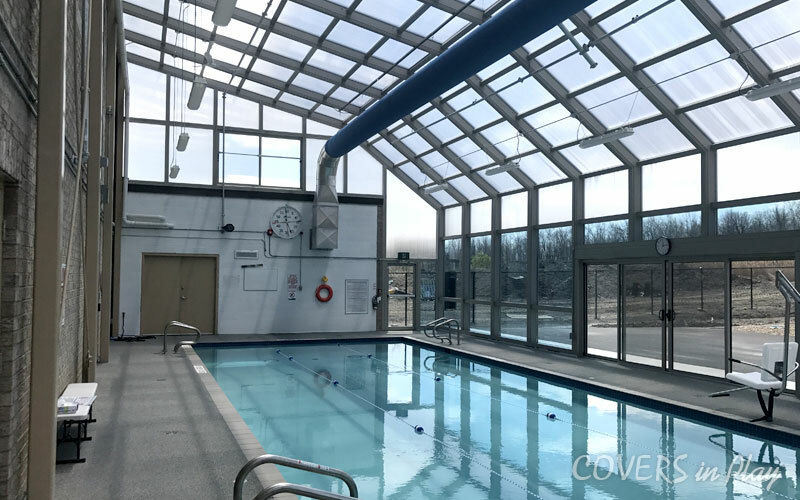 COVERS in Play enclosures can be built over outdoor spaces for swimming pools, patios, restaurants, event venues and even rooftop areas if desired for commercial applications. 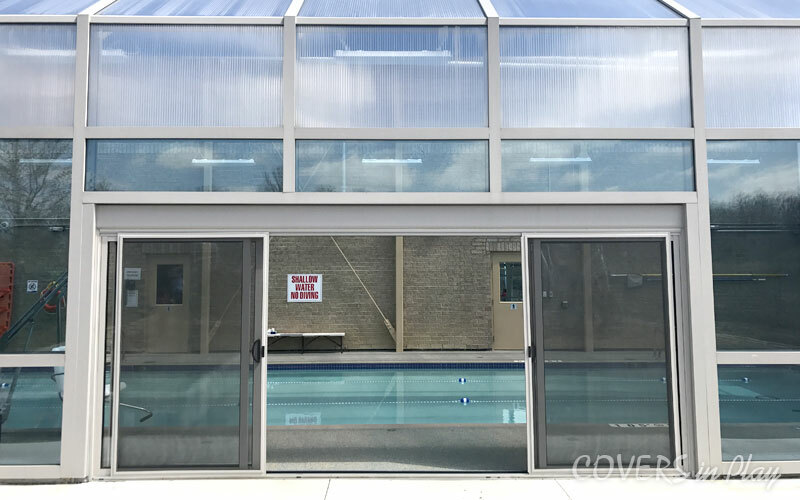 Lightweight aluminum extrusions, clear acrylic side wall vision panels and twinwall polycarbonate roof panels are fabricated with stainless steel hardware into a series of panels which form moveable bays. The bays are dimensioned to slide under one another, nesting together at one end of the enclosure. Or, they can be configured to open from the middle toward both ends if desired. The side walls and end walls can incorporate any number of windows and doors as may be desired. 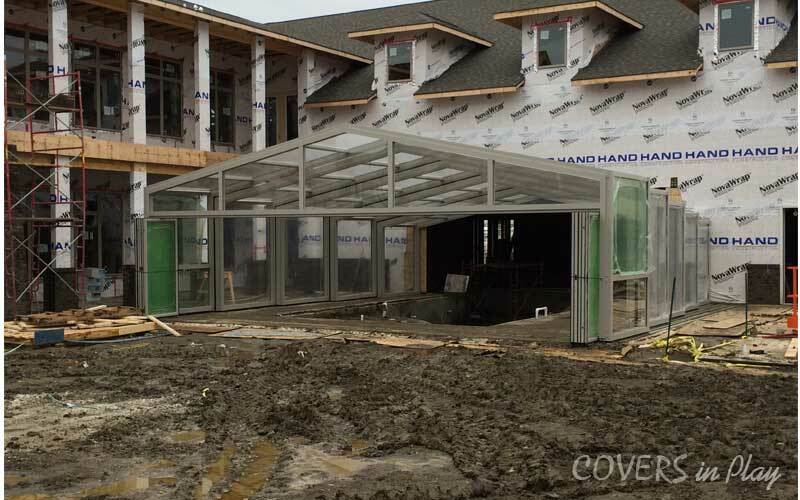 An enclosure can be built to attach to a building or made to be free standing, if desired. Lean to style as well. Fixed or operable. 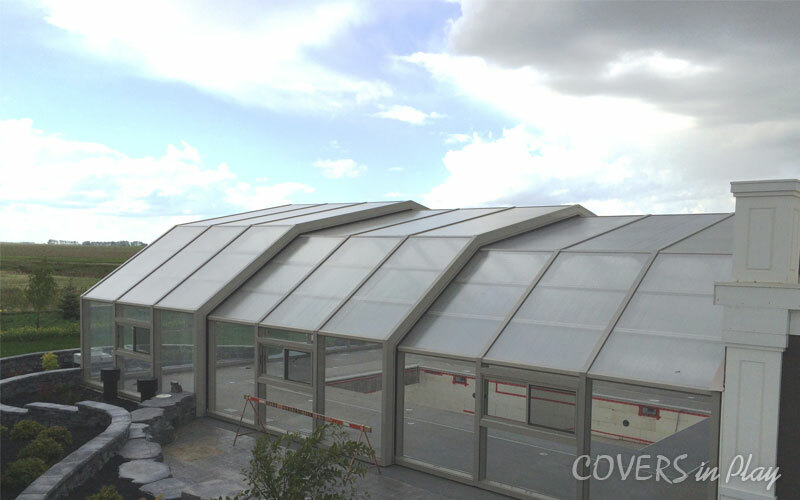 It can also be configured as an operable roof or skylite. 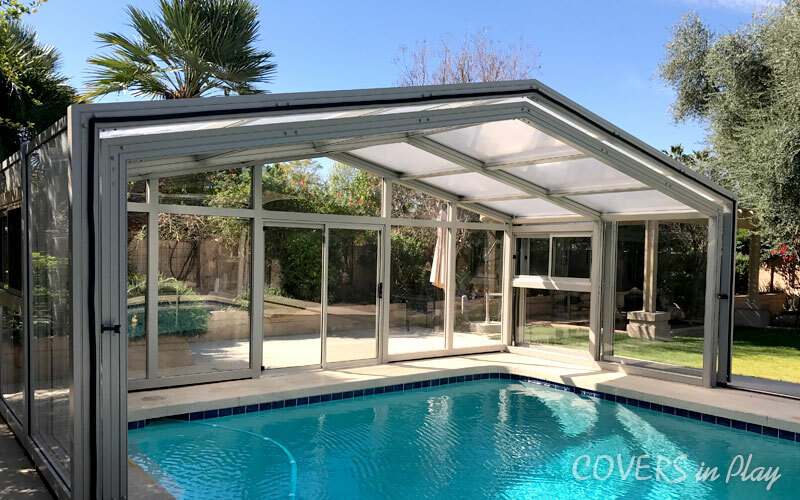 The patented COVERS in Play retractable pool enclosure systems have been designed as a elegant, light weight, thermally efficient automatic retractable system, giving maximum uncluttered outdoor views of the exterior without trusses, webs, cross beams and additional supports for long spans. 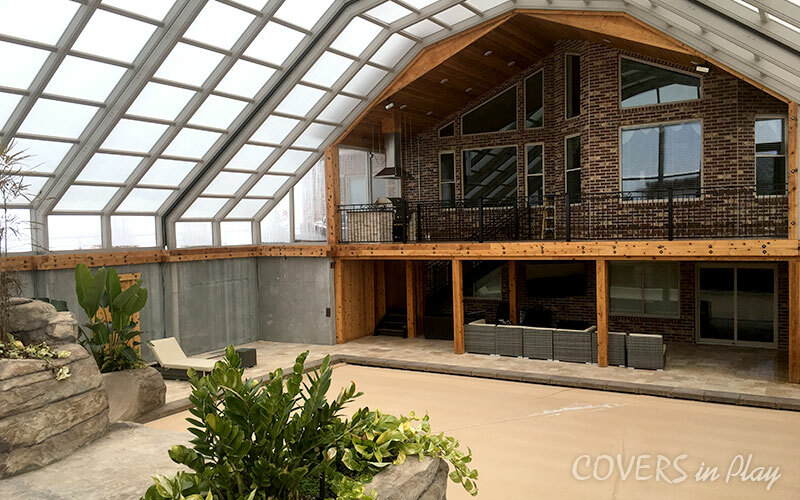 The result of this patented framing system is larger clear vision field and end walls with a slender design, that is light enough for flowing retraction movement and still give the required strength for the toughest of load requirements for any local Building Code. Smooth quiet retraction movement is achieved with a patented electric retraction system. The maintenance free system operates with tracks installed flush with the deck, without risk of tripping hazard. The switching is designed for failsafe operation to prevent damage or injury should a pet, person or other object be in the track area when in operation. 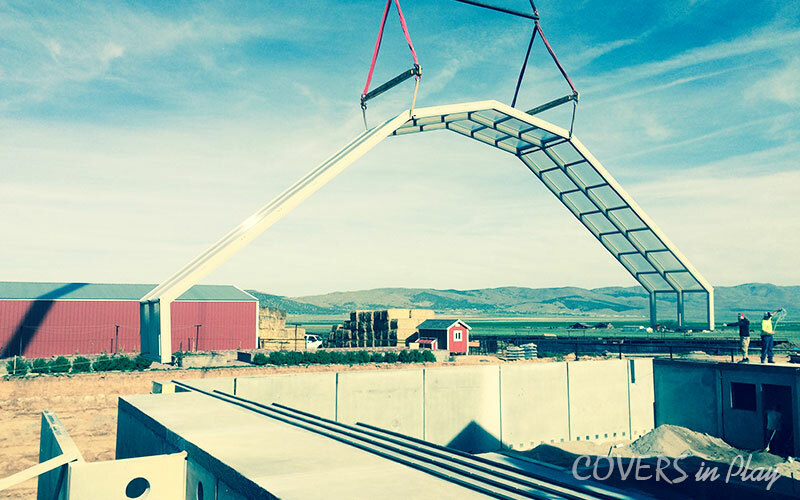 The system is specifically engineered, designed and manufactured for each project and site conditions. Structural foundations designed to meet local building code requirements are required for stability of the patented electric retraction system’s tracks ensuring the integrity and life of the system. 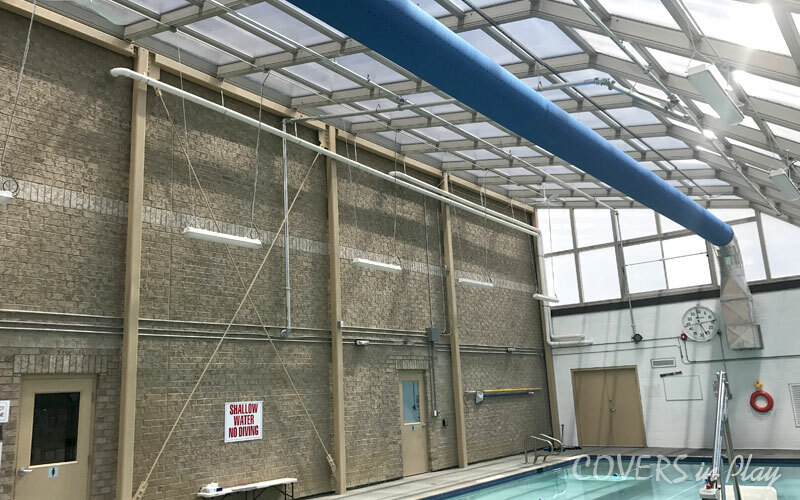 COVERS in Play provides design load details, electrical and dimensional requirements. 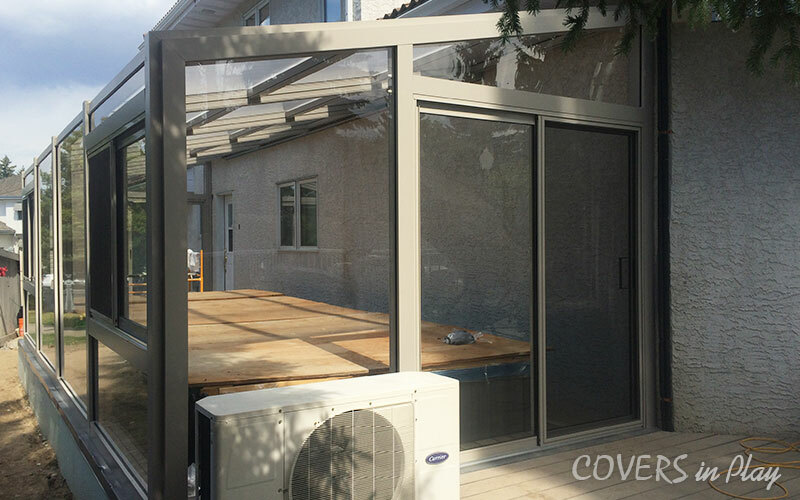 The system can include any number of man doors, sliding glass doors with flyscreens and horizontal sliding windows with flysecreens, positioned as per customer’s requirements. 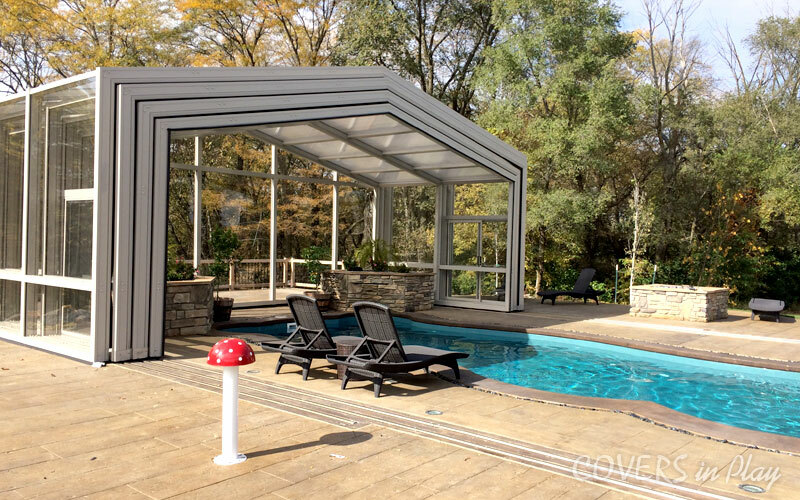 Patented aluminum extrusion assembly design streamlines structural dimensions so that a lean, clean look is achieved without the use of additional trusses and supports. There are no structural members left obscuring the openings when retracted. 100% open air above the area opened. 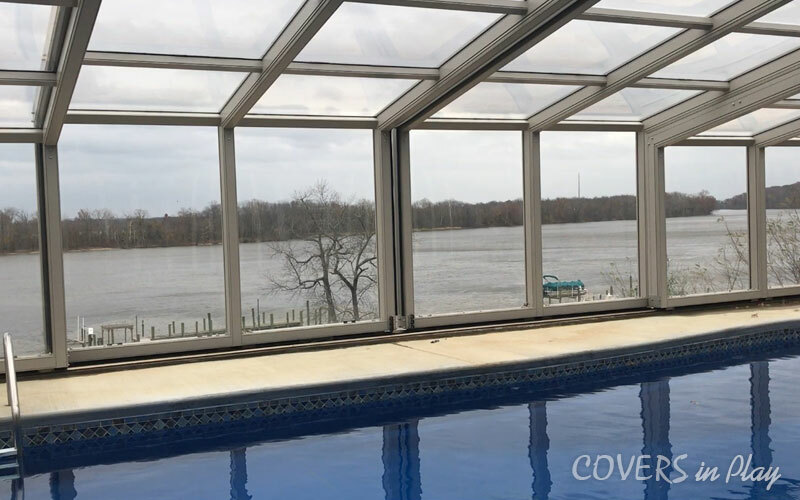 Options available include tinted and opaque thermoplastics, glass, insulated panels, etc..
All framing and components, stainless-steel fasteners, synthetic weather seals, baked on paint finish, etc., have been designed and selected for outdoor, exposed, humid environmental conditions. Nothing will rust corrode, mould or rot. No de-humidification is required for the structure. 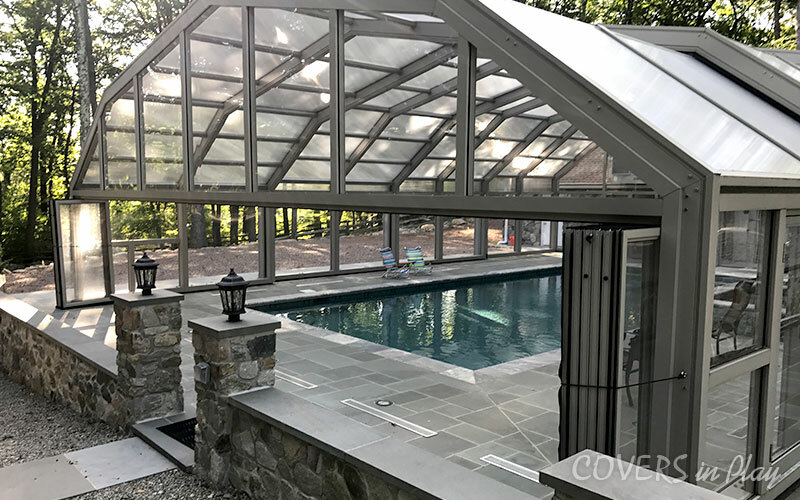 Our custom pool enclosure systems have been explicity designed to be pre-manufactured at the factory so that fast simple assembly can be achieved at the installation site, usually within a week or so, depending on size and complexity of design. The concept model illustrated here shows a square shaped building footprint. 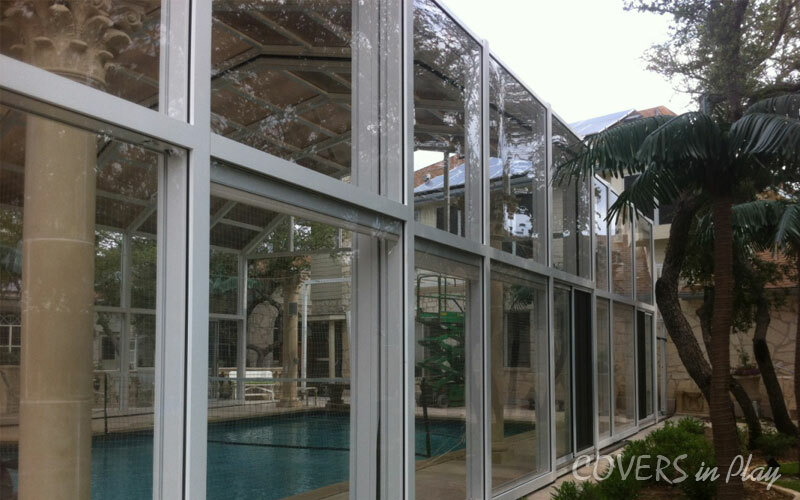 The COVERS in Play above ground pool enclosure system can be made in almost any configuration. Square or rectangular is optimum for manufacture and installation; however L-shaped, or other configurations can also be accommodated. 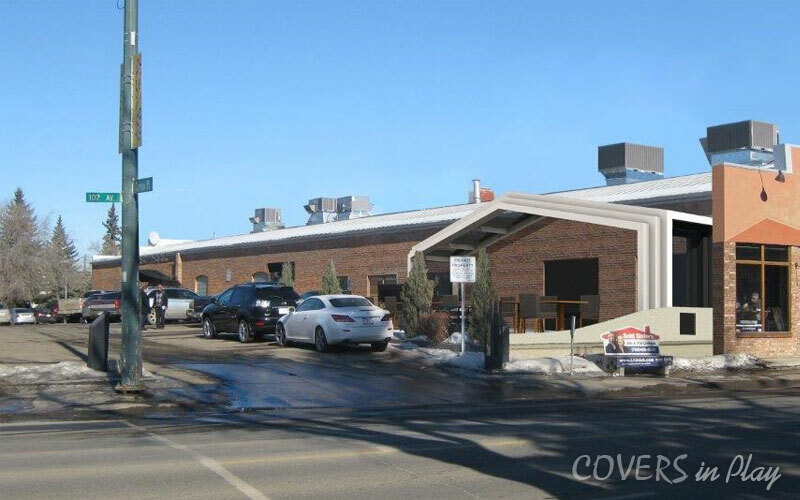 This modular concept illustrates 12 foot high side walls with triple peak roof profiles. 12 foot high elevated beams support central roof systems which can be opened and closed independently or simultaneously with both sides when operating. 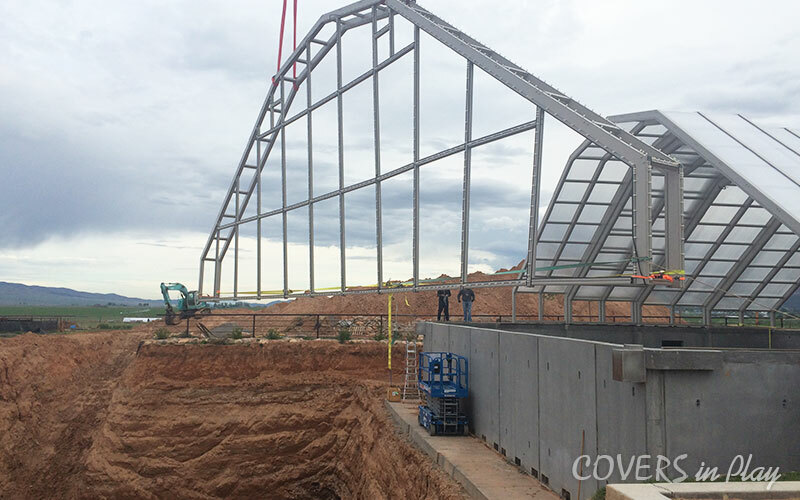 Number and sizes of modules can be designed according to client requirements and site conditions. Same with overall dimensions, overall heights, spacing of beams, spacing of columns, exterior windows and doors, etc.. 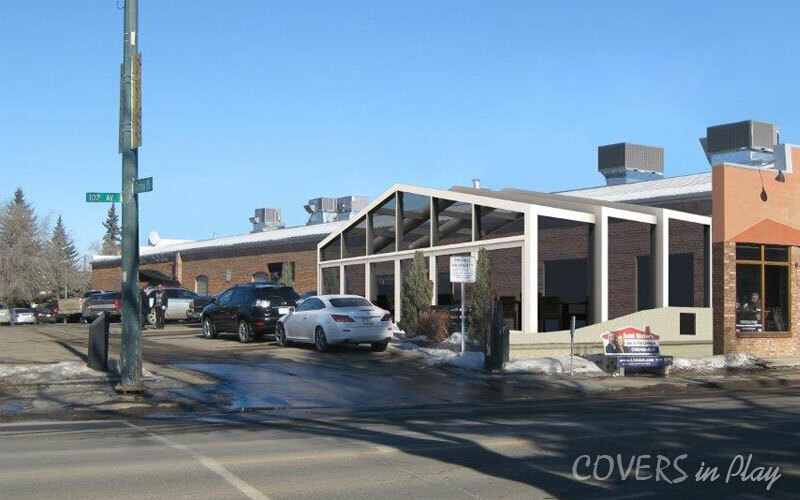 This concept illustrates 50% of the area exposed to the outdoors when opened. 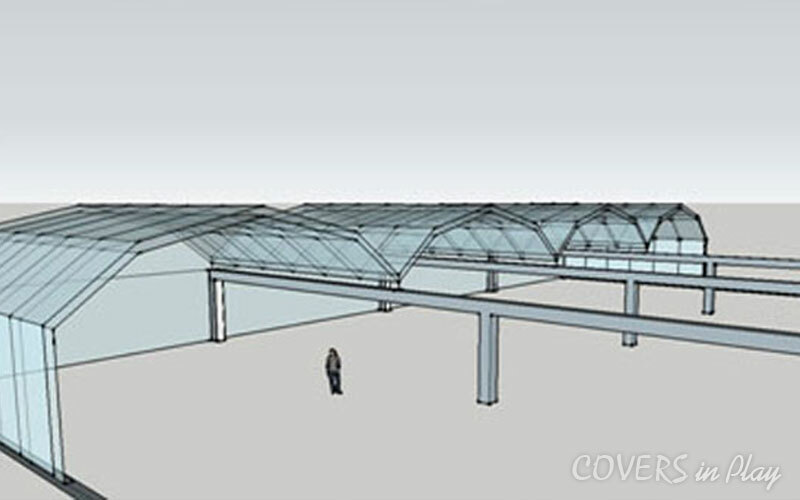 The system can be designed to have as many operational bays as desired, meaning that a much larger percentage of open area is possible, if desired. Operational bays may move more to one end if desired. The system is entirely custom made and engineered for each installation, allowing for more imaginative concepts to be realized. 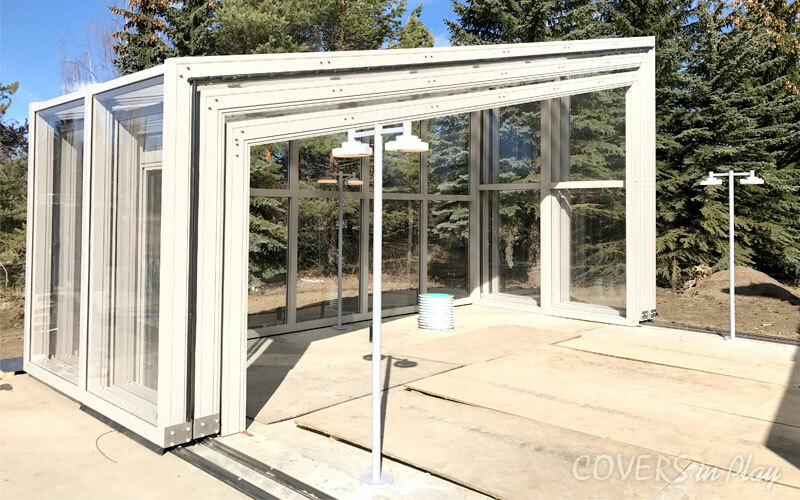 COVERS in Play enclosures have been designed for use as environmental clean rooms to control the internal environment for sanitary climate control. Any size room can be built to accommodate manufacturing and assembly of sensitive equipment or machinery, pharmaceutical products or scientific research creating a localized environment where environmental pollutants such as airborne microbes, dust, chemical vapors and aerosol particles are to be eliminated. Clean food processing and packaging areas, medical or any other spaces where isolated environmental control is required can be created with bright, open, line of sight inspection areas, work stations and operational flexibility for the end users. When the clean room enclosure is closed positive air pressure can be maintained over long periods of time or indefinitely with HEPA or ULPA filtered air cleaned of any unwanted contaminants. When required after the manufacture or assembly of medical, aerospace or other large sensitive equipment or processes, the industrial clean room enclosure can be opened completely with the bays moving apart to allow the removal and/or replacement with overhead cranes or other equipment depending on the application. Fast and easy removal of waste, cleanup and switch-out and re-tooling can greatly enhance the clean room efficiency, overall costs and experience for the operator/owner of the clean room.